The antibody only recognizes the pro-form of Caspase-7. It does not react with the cleaved forms (active enzyme) of Caspase-7. Synthetic peptide within Human pro Caspase-7 (N terminal). The exact sequence is proprietary. Jurkat cell lysate and human lung squamous carcinoma. Our Abpromise guarantee covers the use of ab32067 in the following tested applications. Lanes 1 - 6: Merged signal (red and green). Green - ab32067 observed at 38 kDa. Red - loading control, ab18058, observed at 130 kDa. 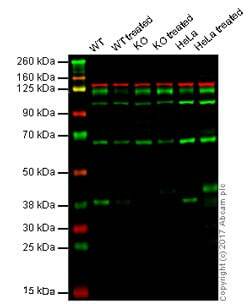 ab32067 was shown to recognize pro Caspase 7 when HAP1 + pro Caspase 7 knockout samples were used, along with additional cross-reactive bands. Wild-type and pro Caspase 7 knockout samples were subjected to SDS-PAGE. Ab32067 and ab18058 (Mouse anti-Vinculin loading control) were incubated overnight at 4°C at 1/1000 dilution and 1/10000 dilution respectively. Blots were developed with Goat anti-Rabbit IgG H&L (IRDye® 800CW) preabsorbed ab216773 and Goat anti-Mouse IgG H&L (IRDye® 680RD) preabsorbed ab216776 secondary antibodies at 1/20000 dilution for 1 hour at room temperature before imaging. 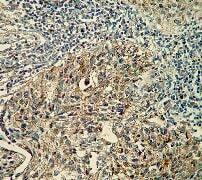 Immunohistochemical analysis of paraffin-embedded human lung squamous carcinoma using ab32067 at 1/50 dilution. 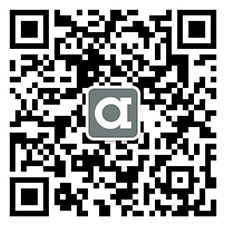 There are currently no Customer reviews or Questions for ab32067.